In 2016, the American broadcasting network Fox debuted a TV series based on the 1971 William Peter Blatty novel The Exorcist. Creator Jeremy Slater’s journey back into the world originally established by the novel was received positively by critics. Whereas Season 1 focused on telling the whole story of the demonic possession that grips the Rance family, Season 2 followed the format of an anthology series, where Fathers Tomas (Alfonso Herrera) and Father Marcus (Ben Daniels) come to the aid of another family whilst tackling a number of additional ‘problems’. Although several of the main characters (e.g., both Fathers Tomas and Marcus) in the show appear in both seasons, many do not feature in Season 2. Mirroring some of the significant changes in the show between seasons, composer Tyler Bates wrote the score for the second series, taking over from Season 1 composer, Daniel Hart. For me, despite Bates’ forays into more orchestral scores such as Watchmen, Conan The Barbarian and the fun scores for Guardians of The Galaxy, it’s hard for me to shake his association with the horror genre; and the less-than-enjoyable listening experience his scores for these movies have given. For example, the Halloween remakes (I and II) and The Darkest Hour were not good experiences, and when I saw his association with The Exorcist I was not encouraged. Subsequent to hearing that Bates was on-board with The Exorcist, I was pleased to read a couple of reviews that offered praise for the music. However, having now listened to Milan Records’ release of the score for The Exorcist, I have to say that my original opinion remains the same. The opening cue, “Release This Woman”, despite being less than a minute in length, ably summarises much of the unfolding 50 minutes. Pounding percussive elements are punctuated with random electronic effects and short snatches of orchestral ideas that flit in and out of the sonic arena, and it’s all underscored with an ambient sonic landscape. By the end of the 50 seconds, I found myself thinking, ‘what the hell?”. A situation I would find myself in numerous times during the course of the album. Numerous other tracks follow the same recipe of using ambient underscoring that rumbles along with the addition of various electronic effects and blasts of short orchestral motifs (e.g., agitated and pizzicato strings) (e.g., “Andy Breaks Down”). “False Demons” varies the template through added thumping percussion and wailing choral stabs, and electronic rhythms and shrieks intersperse “Brutal History”. But, regardless of the various elements used, it just feels like everything is just thrown together in an attempt to create a meaningful level of terror. Another example of Bates’ technique can be heard in “Come For Carol”. Here, the sustained drones and electronic effects are supplemented with percussion rhythms of varying tempo but this again fails to stir any emotional response at all. Bates adds vocal elements at various points in the score that do echo other scores of this genre: ethereal voices (“Crow Attack”), wailing choral elements (“Holy Pastries”, “Nikki Suicide”), and recited choral text passages (“Mouse’s Story”) add some variety to what’s gone before but the percussive elements and drones are never far away. The use of piano delivers brief respites from the horror elements but their appearance are usually all too brief. For example, early tracks such as “New Family” and “Bloody Hands” feature sparse piano lines that then develops into vague string ideas to give the merest hint of some kind of humanity. But these don’t develop into anything more substantial (I assume that their early appearance represents a family before everything begins to fall around them). Even the presence of a delicate harp that punctuates another tinkling piano-containing cue doesn’t hang around long and is replaced by threatening ambiences and atonal crescendos (“Grace Isn’t Real”). There are some good and interesting moments to The Exorcist but they tend to buried and hidden away in amongst the cacophony. “Nikki Suicide” has an interesting violin passage. Some of the ideas heard in “False Demons” come together to create an appealing musical idea; particularly with the use of choral ‘stabs’ blended with pounding percussion and staccato brass. A solo string lament gives a welcome passage of melody (“Dolores”). It’s not until “Andy’s Final Words” – the final track composed by Bates to feature on the album – that we begin to hear a more cohesive orchestral sound. Here, ear-friendly ambient underscore combines with a delicate acoustic guitar and we get is a genuinely emotional ending. 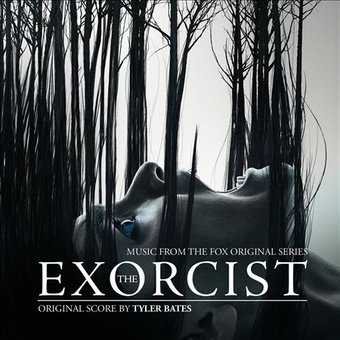 The album closes with Daniel Hart’s original main theme (“The Exorcist – Main Title Theme”). There’s a sprite and jaunty piano theme, accompanied by whistling: it’s an interesting musical idea that grabs the attention immediately. The main effect of including this theme is to serve as a starting point for wondering whether Milan would have been better releasing Hart’s score for Season 1 rather than Bates’ music for Season 2. Overall, the whole effect of Bates’ score for The Exorcist comes across as cue after cue of unstructured ideas strung together in the hope that the feeling of horror – or at least a tense unease – will result. It’s at this point for scores such as this that reviewers are meant to suggest that this sort of music is likely to fit better in the show. That’s fair enough, but if it doesn’t play well away from the media for which it was composed, why release it? The Exorcist is a frustrating listen: where there’s some promise at the start of tracks (e.g., “Chaos”), that promise is thrown away by reverting to stating idea after idea in a disjointed way so that you end up forgetting the promise the cue started out with. You end up just remembering the confused cacophony the track ended up becoming. And that’s essentially the feeling by the end of the album. The score is available on CD and can be downloaded from various online digital stores. Audio clips are available HERE.